Takeru Kobayashi of Nagano, Japan has once again proven his mastery of weenie snarfing by sucking down 47 Nathan's dogs in 12 minutes. Yeesh. 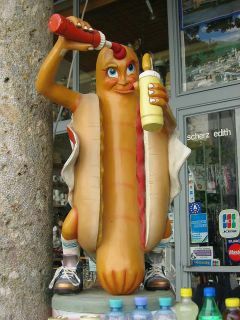 Figure 1: Disturbing hot dog image. Interestingly, Mr. Kobayashi, who must have a hell of a lot of free time, also holds the record for cow brain snarfing. 17.7 pounds of cow brain. What the hell makes a guy get up in the morning and say, "Yes indeedy! Today I will be the world champion cow brain eater. Yessiree bub, I'm gonna be the best and fastest cow brain eater there is!" I think I'll stick to "things that don't come out of the head", thank you very much. Shoulders, loins, fine. Brains? Nope. I'll leave that for the "Feed a Hungry Zombie" fund. That hot dog dude is gross. It looks like he is thrusting his groin at me. And I don't like it! And it looks like he's doing a "full body lube" with something that's surely not "latex-friendly." hot dogs are wrong in general.